Magic has changed A LOT in the last decade or so. One of the biggest changes to magic has come as a result of the Internet. Whereas magicians used to trek to their local libraries or clubs to learn their secrets, young amateur magicians can now find all the magic they need online. But what is the best online magic shop for this? Today I’m going to talk about my top 3 online magic stores, and why I’ve ranked each one where I have. Penguin Magic is the equivalent of an online library of magic. Almost all the magic tricks you can imagine are sold in some shape or form at Penguin. What I love about Penguin Magic is the way they make it so easy to connect with the individual creators. These are 20 or so of the top magic creators at Penguin. You can click on their name to get taken straight to a page full of their best tricks. 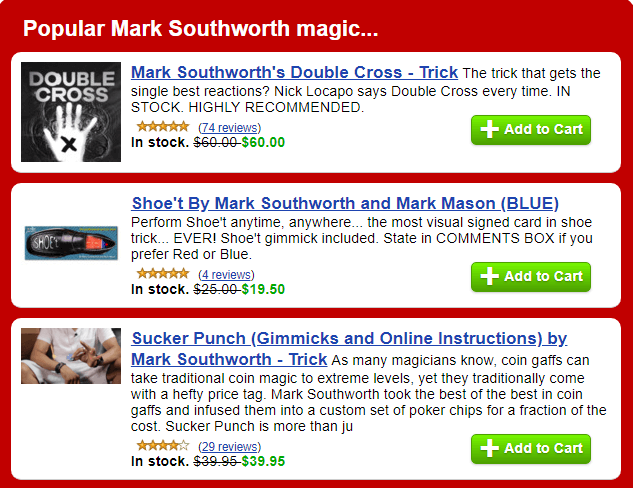 For example, if we click on ‘Mark Southworth‘ we see all the tricks by Mark Southworth and which ones are trending right now. Another great feature is the ‘bestsellers‘ list on the right-hand side. This list contains the top 20 trending magic tricks; it’s a great way to keep an eye out for up and coming effects and creators. Plus, if you’d rather a broader view you can access their all-time bestsellers lists to get an idea for the safest bets. Alternatively, you can search the name of your favorite magician in the search bar and you’ll see all the magic created by them. I personally am a big fan of Dani DaOrtiz so I’ll come back to Penguin every now and then and type his name into the search bar. Just hitting enter is then going to bring up a huge list of all the tricks he’s created, in one place. Penguin Magic is great for those who know what they’re doing, but for someone new to their website, they might find it confusing. It’s very cluttered and doesn’t feel as smooth or easy to browse as Conjuror Community for example. Now, Penguin Magic is great. If you’re in the US. However, for magicians from other countries, Penguin Magic can be frustrating as shipping becomes a lot more complicated and expensive. Penguin have done a good job of trying to make quite a few tricks available for free shipping to the UK, but there’s a LOT of products that just aren’t realistically available to us. That’s why, for magicians from the UK, I always recommend buying from Merchant of Magic. The Merchant of Magic is the UK’s version of Penguin Magic. It’s the UK’s biggest magic shop, based from the south of England. It has over 10,000 magic tricks permanently in stock and every member of the sales team is both professional magicians and members of the Magic Circle. Those are some pretty good credentials, but how does it measure up? Merchant of Magic scores highly on a lot of the same points as Penguin Magic. You can easily sort the magic by categories to narrow down the results to only the most relevant. Similarly, you can also sort the magic by magician using the ‘magicians’ tab on the left. If the magician you’re looking for isn’t listed there, just use the search function to get all the relevant results. Another great part of the Merchant of Magic site is the blog. The Merchant of Magic has hundreds of blogs up full of advice on learning magic, improving performance skills, and pretty much everything you could imagine related to magic. Plus, I myself have been lucky enough to contribute some ideas to the Merchant of Magic blog and I’ve been impressed by the team; they’re really friendly and happy to answer all questions you might send in to them. Again, the main issue with the Merchant of Magic is based on location. It’s perfectly fine to order from the US but you might find delivery times to be slightly longer, and shipping costs marginally higher. The third and final online magic store on this list provides a unique angle on the online magic space. The vast majority of tricks offered on this site come in the form on online lectures and downloads. This negates the issues of country based shipping and waiting around for your order to arrive. I think digital magic is going to be a game changer in the online magic space. As I mentioned before, digital magic is just magic that is available to buy online and download. You can watch the videos and learn the magic regardless of location and you don’t need to worry about ANY shipping costs. Which sites offer the best digital magic? I believe that both Penguin and Merchant of Magic provide download ready magic, but the best online magic shop orientated specifically to this kind of thing is Conjuror Community. I didn’t discover this magic shop until earlier this year, and I instantly realized I’d been missing out. Conjuror Community can’t compete with shops like the Merchant of Magic or Penguin in terms of physical, stocked, magic. But the area they shine is within, as I’ve said, digital and instantly available magic provided in the form of online videos and lectures. The team behind Conjuror Community, Adam Grace and Aaron Fisher have over 50 years combined in magic and you can be sure they only but their absolutely highest recommended products up for sale. Like the others, they have a simple to use shop that enables you to search by category. 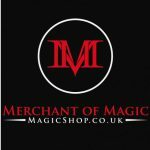 Like the Merchant of Magic, they also have a blog section where you can read all about improving your magic for free. Most magicians will be very familiar with the Invisible Deck. The Invisible Deck is a trick that is used over and over again by magicians all around the world. I’m sure most of you know what the effect looks like, and probably even use it a lot yourself. In case you don’t, here’s a quick recap. The magician asks the spectator to simply imagine ANY card they want. The card is absolutely a free choice; the spectator really can pick any card in the deck. Once they’ve done so, the magician removes a deck of playing cards from his pocket and invites them to simply name that card out loud. As they do so, the magician begins to run through the cards. All the cards are face up except from one card. When that card is turned over, guess what? It’s the spectator’s thought of card. Anyone who’s performed this trick will know that it gets great reactions. In fact, I’d go as far as to say that it gets some of the best reactions of ANY magic trick. But that doesn’t mean it’s perfect. There’s a couple of issues with the Invisible Deck. Firstly, it’s not 100% clean. The cards can’t be touched or shuffled by your spectators. Secondly, it requires a little bit of mental maths. The maths is not necessarily hard; in fact, it’s really easy. However, whilst under pressure the nerves can get to you and this phase can end up being a little stressful. Second Sight is a digital product offered by Conjuror Community that creates a similar effect to the Invisible Deck whilst avoiding the problems of it. 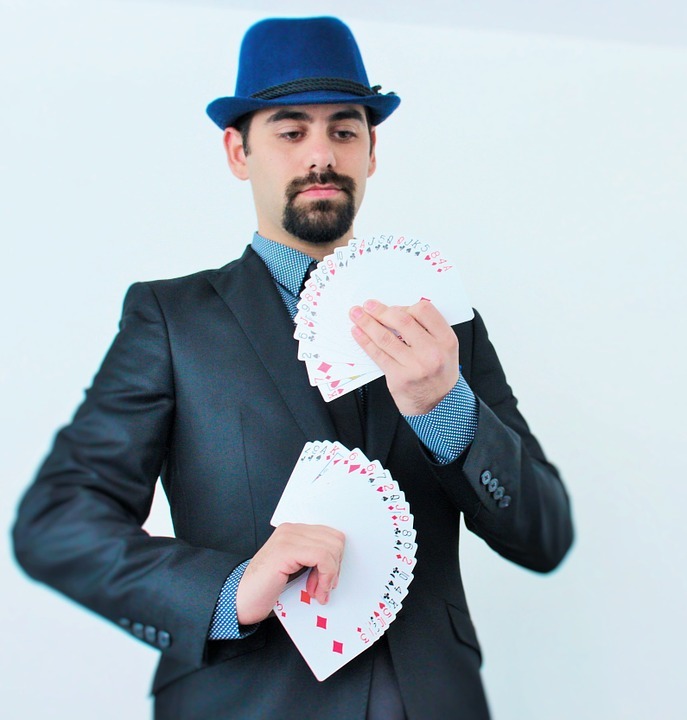 In this version, the cards CAN be shuffled by the audience and it doesn’t require the math element of the Invisible Deck. Plus, you’ll learn how to create your own deck. This is just an example of the kind of products you’ll find at Conjuror Community. If it sounds like the kind of thing you’d be interested in, definitely check them out. However, for me, their strongest aspect is not just these products but the Conjuror Community Club. This is where these guys really outdo themselves. What’s better than all the amazing products we just discussed? 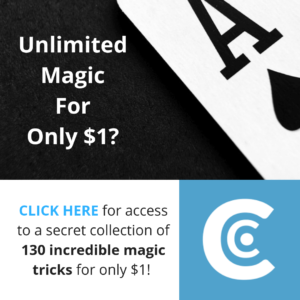 Well, rather than paying for each individual magic product you want, you can get instant access to over 30 video training programs, over 80 lectures from professional magicians, support from a growing global community of magicians, and even live 1 on 1 coaching with magic instructors. All for less than what you probably spend on coffees each month! You can learn all about the Conjuror Community Club in my upcoming detailed review of the program. Keep an eye out for it; I’ll inset a link here once it’s done! The only real cons to this shop is that there isn’t as much magic as the other shops. Yet. Conjuror Community is relatively young in comparison to the other magic sites listed so you can be sure they are going to be producing more and more quality products over the coming years. So, there you have my personal top three online magic shops. Check each of them out and let me know what you think in the comments section below! Don’t forget to share this article if you enjoyed it. That’s exactly right! Great idea, there’s lots of awesome magic to be found at the other sites too. Let me know how it goes! I liked Penguin Magic because they have “Rubber Deception by Joe Rindfleisch”, I watched his video and am confident if I purchase I can learn these tricks and carry them out. Magic is only a hobby for me, I’ve always been mystified as to “how and why” things work and learning how to “confuse” others really appeals to me and is quite fun doing actually. “mis-direction” – love it. Benji, thank you for telling me about all of these magic stores, it will take me some days to look over the stores and track down my favourite magic tricks, but after I finish I’ll come back here and tell you what I got. Thanks for the comment! That’s a great idea – keep practicing and you’ll definitely figure it out soon. Enjoy your shopping! That’s really interesting. I’m not a real magician but like to do some tricks for the kids at some parties. I think I’ll have to go with the conjuror community due to not living in Europa or US, that’s ok, This online magic shop is the one I like best anyway. Great idea! Conjuror Community is a solid choice since you can access it from anywhere in the world. Hope you enjoy it. Hi, Benji and thanks for the post. I really enjoyed reading it. I have always been intregued by magic and have a deep respect for those who try to and have mastered the art. Some are so good at it it’s just blows your mind. I really get a bang out of those who do slight of hand card tricks. They are performed jup close and the magicial has to be flowless in their presentation. I have never attempted to try and learn some magic but as a newbie, what trick would you recommend for a someone like me who has never done this before? I’m almost 70 and even learning one trick would be a personal accomplishment. Do you have any Youtube videos of your work? Hey Wayne. Thanks for your comment. Magic is definitely a great art to watch in person. That’s a great question! I’d probably recommend The Invisible Deck– it’s really easy and doesn’t require any sleight of hand, but it gets great reactions. I think a great idea for a Christmas gift for children. My stepson is obsessed with a variety of tricks. He’s only seven years old though, yet he sometimes shows tricks I am to wonder about. I look at your list of Magic Kit for Kidd. The Uncle Bunny Magic Kit could be good for the start. I’m sure I’d better show tricks than playing computer games all day. That’s a great idea – The Uncle Bunny Magic kit is a solid choice! What a delightful site this is. My son I and both enjoy it it immensely. He has picked out two christmas presents and counting. he really enjoy your explanation of Penguin Magic. I learned a lot about magic tricks, before I read this, I had not idea you find magic stunts online. This has open a whole new world for me. Thanks for your comment! I’m glad you enjoyed. The Daily Magician is a participant in the Amazon Services LLC Associates Program, an affiliate advertising program designed to provide a means for sites to earn advertising fees by advertising and linking to Amazon. Certain content that appears on The Daily Magician comes from Amazon Services LLC. This content is provided ‘as is’ and is subject to change or removal at any time. Completely self-working—no sleight of hand required! Looks like real magic...your audiences will FREAK OUT! Can be done with ANY deck at ANY time!